Dr. Gordon is fast becoming an expert not only at performing various applications but remembering to put together great images and video for teaching others. And don’t forget, the patient’s family members can make great assistants! Below is his first submission to the EDE Blog but I have no doubt there will be many others. DVT is “standard” EDE2 but I’ve just never found one myself. This patient was 2 weeks post-op. She complained of bilateral leg pain. She seemed to be more symptomatic in the normal leg. While I was doing the POCUS she winced when I squeezed the left calf to test for augmented Doppler flow. Anyway I made a jpg of bilateral femoral flow with augmentation and the (L) popliteal with/without compression. The (L) popliteal with augmentation showed a little peripheral flow around the clot. The reason I’m posting this is to show that with max. 5 minutes you can really easily see a DVT. I fussed around a bit to get some “nice” pictures. The daughter pressed the freeze button on demand so I could get the augmentation pictures. As one can see in the images, there is echogenic clot within the vein. Approximately 85% of DVTs have evidence of echogenic clot. 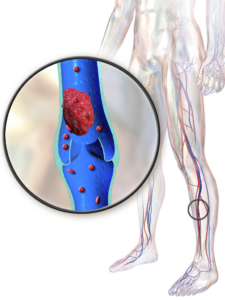 In 15% of DVTs, the clot is pitch black, just like blood. In the vast majority of DVT scans, one does not need to use color Doppler, augmentation, etc. This is what we teach at the course and what the research has shown. The occasional case when you might want to use color Doppler is when you are having difficulty distinguishing an artery from a vein with anechoic clot within it. The lumen will be black in both cases. Turn on color Doppler to look for flow. Brisk flow suggests you are looking at an artery. The absence of flow suggests that you are dealing with an anechoic clot filling the lumen of the vein. P.S. The 85% number does come from a research article, but I’m blanking on which one. Time for more coffee!